Cook the perfect breast roast for a delicious feast anytime! Roast or rotisserate plain, marinated or with seasoning. Sprinkle lightly with rosemary, salt and pepper, or paprika, parsley, salt and pepper, or thyme, paprika or cayenne, salt and pepper, or seasonings of your choice. Cook approximately 15 – 20 minutes per pound to a temp of 170°F. 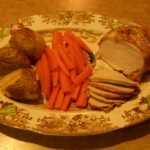 When cooked to perfection, the turkey meat and juices may have a slight pink tinge. It is important to let the roast rest for 15 minutes before slicing and serving.